Being pregnant is an extraordinary experience for many women. To be able to carry a new life within your body is the greatest miracle that there is. It’s usually hard to believe that a new person is developing within your own abdomen. With ultrasound you get a glance, but even then, it is almost too wonderful to comprehend. Soon you will be the mother (or father) of a new human being, a beautiful little baby with life, a complete bed of roses. And then the day of giving birth arrives. You feel all kinds of things in your abdomen, back and in your emotions. Your world becomes very small. Nothing is important anymore except for you and your baby. Women usually withdraw into themselves when giving birth. They will give you an answer but their focus is directed at what is going on inside their bodies. Giving birth can be one of the greatest confrontations a woman faces. Nature does its thing and your best choice is complete surrender and cooperation with these primitive forces. Nowadays, women who know they fear childbirth can be coached by a doula. These are wonderfully educated women who prepare and support the father and mother during childbirth with their loving attention. I personally know a few doulas that I would have loved to have with me during my deliveries! Childbirth is extremely intense and stressful for a woman. Some women find it so difficult that they have an out-of-body experience. After giving birth, they have the feeling that they weren’t completely present, that it’s all hazy and they usually can’t enjoy their babies. This is often called a “postnatal depression”. This happens much more often than people realize. What can the MIR-Method do? After giving birth, the mother can experience any number of disturbances. It is really great when they are familiar with the MIR-Method and can start doing it right after giving birth. Even better is when they begin during the pregnancy! Step 1: “Optimize acidity” supports step 2. Step 2: “Detox all toxicity” after giving birth takes care of removing the emotions that are no longer necessary. This can be grief about your partner not being there or, for example, anger about how you were treated. The more quickly you get rid of these emotions, the better. Step 3: “Detach father. Detach mother” has an indirect effect. It’s possible that the helpers around your bed bothered you. You detach yourself again from all the influence they had on you. Examples are the doctors and assistants in the hospital who came to see and learn from your delivery that used forceps. Step 4: “Clear meridians” has the effect of strengthening a woman after birth. Especially the stomach and milt meridians get quite a blow. These are the meridians that help to ground you. When a woman gives birth, she can leave her body and have trouble afterwards with the daily, practical chores. Step 5: “Supplement all shortages” helps a woman who has given birth to replenish essential nutrients, such as minerals, but also iron lost through loss of blood. Many women suffer from “postnatal depression” while this is actually caused by a shortage of minerals that they fell short of during their pregnancies. With step 5 these shortages are supplemented so that a new mother can recover and, for example, can think clearly again. Step 6: “Balance hormone system”. With this step the pituitary gland is brought into balance more quickly, triggering, for example, the production of milk. The production of progesterone and relaxin is in balance again more quickly, strengthening tendons and ligaments and quickening the process of recovery from pelvic instability. Step 7: “Fulfill basic needs” is very important for new mothers. Childbirth can be a lonely experience full of intense emotions. It helps to be able to give yourself Comfort, Security and Protection so you can deal with these intense emotions more quickly. Step 8: “Optimize Chakras and Aura”. Childbirth disturbs the lowest two chakras. A lot happens there physically but also energetically. Childbirth also causes personal development. Sometimes chakras open up spontaneously, including the higher chakras. Women can develop clairvoyant, knowing or clairsentient abilities. They know and feel exactly what their little child needs. Step 9: “Clarify mission”. Women who have the mission to welcome a child to earth feel that directly after childbirth. Their greatest task and mission is to provide the child with protection and to raise it, and this gives them intense satisfaction. Getting clarity about this is the work of step 9 because having children does not provide every woman with the greatest satisfaction. For them, the mission probably lies elsewhere. Always do all 9 steps of the MIR-Method! 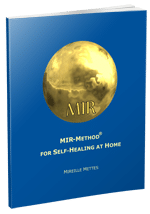 Even if you had children a long time ago, the MIR-Method can still help you with processing the emotions you felt back then and were not able or allowed to express. Just do the 9 steps and your experiences with childbirth will be taken care of. Good luck! Tell me, how was it for you? Did the MIR-Method support you after giving birth? I’d love to hear about it! Please write about it below. Thank you! My wish for you is a wonderful delivery and that the MIR-Method supports your recovery and processing of what has happened.